I knew right away that Wayne was the right choice. He made me comfortable with the process and was always just a text or call away. He did everything he could to get my home viewed as quickly as possible by as many people as possible and it worked! My house sold above asking price after being on the market for only 5 days! I would highly recommend Wayne to anyone who is in the market to buy or sell a home. He was a pure pleasure to deal with! Thanks for everything. Wayne helped me with a real estate question, Wayne recommended that I speak to someone he works with very closely and my question was answered in a very timely fashion and very professionally. I was very satisfied with my interaction with Wayne and his team. I would highly recommend Wayne for all your real estate needs. Wayne is exactly what you are looking for in a real estate professional: honest. He works hard for his clients and pours his heart into his work. Great guy and a great realtor. I referred a client to Wayne and he went above and beyond to help them sell their home. He was very professional and caring to an extremely stressful situation. I would highly recommend Wayne. He is truly a fantastic real estate agent and person! Wayne is a great guy and an excellent realtor. I’d recommend him to anyone I know who is purchasing or selling a home. We worked with Wayne on the purchase of our home, and are using him again on the sale of it. He’s responsive, honest, courteous and works hard to achieve the best results for his clients. With my home just being listed for sale with Wayne, I feel he has done an excellent job thus far making a high quality listing that accurately reflects my home and with his efforts, I’m confident he’ll be able to effectuate a sale soon. We have worked with Wayne twice; both in the buying and selling situations. In both, he has been a very hard worker and dedicated to our needs. If you’ve ever bought or sold a home, you know how stressful it can be. Wayne’s calming personality and responsiveness were extremely helpful. When I sent Wayne a panicked email at Midnight I always had a response in the morning addressing my concerns. I would have no hesitations recommending Wayne as a realtor. We are so very appreciative of all that Team Zuhl has done to help us sell our brother?s estate. They were always honest, professional and trustworthy. We would definitely recommend Team Zuhl to anyone looking to sell a home quickly and for the most money! Thank you so much! As first time home buyers, we were and are very pleased with the exceptional dedication to finding our first home with Wayne and Jean. Wayne made himself available to us at all times imaginable, in order to give us the best service possible. He was very considerate and understanding with everything that we were looking for in our first home and very patient with us in finding those things. He took the time out to explain to us how the Real Estate Market worked and what we could expect to find in our price range. Jean also helped us with the understanding of the positives and negatives of what type of home we should consider. There was no pressure and no rush; they even explained to us the importance of taking our time and making sure that we have made the right decision. After finding that right home for us and going through the closing process, Wayne and Jean helped guide us the entire way. Even to this very day, the both of them are still giving us advice when needed and helping us understand the ins and outs of owning your first home. 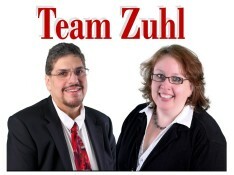 I would highly recommend Team Zuhl for anyone looking to purchase their dream home. They are dedicated, professional, and they have a vast knowledge the Real Estate Market. But most of all, they put you first! With Team Zuhl you can’t go wrong. I worked with Wayne Zuhl to purchase my first home. He was easy to get in touch with by phone and email and he accommodated my schedule when looking at properties. He showed me homes that were within my price range and desired locations and he didn’t waste my time showing me properties that I knew I couldn’t afford. Wayne kept me up-to-date during each step of the home buying process and helped ensure everything was on track for closing, which was especially helpful for a first time home buyer. Wayne really listened to my needs and concerns and made the home buying process easy! As a real estate attorney, working with an agent of Wayne’s caliber makes all the difference. He is a true professional who knows the local market and always goes above and beyond for his clients. I have and will continue to refer Wayne to anyone interested in buying or selling a home in NJ. My house sold quickly and was in a bidding war within days of going on the market. Wayne went above & beyond for us. He guided us through the whole process & answered every question we had & trust me we had many! Thanks again for a job well done Wayne! He made the process easy and at the end of the day I got the house and monthly payments I wanted.